This series is a 4-koma adaptation, with fairly short, humorous high-school romance scenes, showing four couples in every 12 min episode. Its art and animation are somewhat simplistic, but very cute and the whole plot consists of simple scenes of dialogue between teenagers in love. Doesn't sound that appealing? But it is. Thanks to the great writing, humour and light-hearted mood of the story, it's one of the most enjoyable shows I've seen in recent past. Sometimes, in less than three minutes, it was able to produce scenes and characters more memorable than many full length, 24-episode series ever could. For me, it is an obvious 5/5 star show and definitely worth your attention - even if you don't like romantic comedies, the smart dialogues and situation humour it delivers defends itself outside of any convention. I have already liked the manga of this and the anime adaptation is great but my biggest advice is give it a few more episodes before judging it as for me it took a few chapters of the manga to work out if I actually enjoyed reading it or not, you really get to see the multiple relationships grow in their own way and its nice to see it happen and not stick to the same couple for a 20 minute episode. "Highschoolers hilariously struggling with the awkwardness that comes with loving someone and/or being in a relationship." That is 90% of the premise of this 12-minute show. Almost every single major character is paired up with someone; perhaps (s)he is only watching that person from afar, or they are already going out - either way, the show follows their attempts to further their romantic ties one way or the other. There are no other subplots, no secondary characters or conflicts acting as a diversion or change of pace, nothing. And the anime still works, amazingly so, due in no small part to the fact that each and every character (and there's quite a few!) is instantly recognizable, every couple dynamic is different, their interactions never get old - and last but surely not least, their antics will leave you rolling on the floor. It also doesn't hurt that the original (manga) author of this show is a comedic genius. No matter what memories you have of romance in high school, some of these situations will be undeniably familiar - and the author uses this to great effect to make you laugh that much harder. The pacing, which can be a large hurdle for anime shorts, is also just right. With so many characters and so little time, there's little room for error, but even during its fastest moments the series does not give the impression that it's blindly rushing ahead. There's somehow enough screentime for everything, which is amazing in itself, but that's not all: the lack of the usual forced status quo allows the couples to use their allotted time to grow and evolve in realistic ways. Incredible stuff. 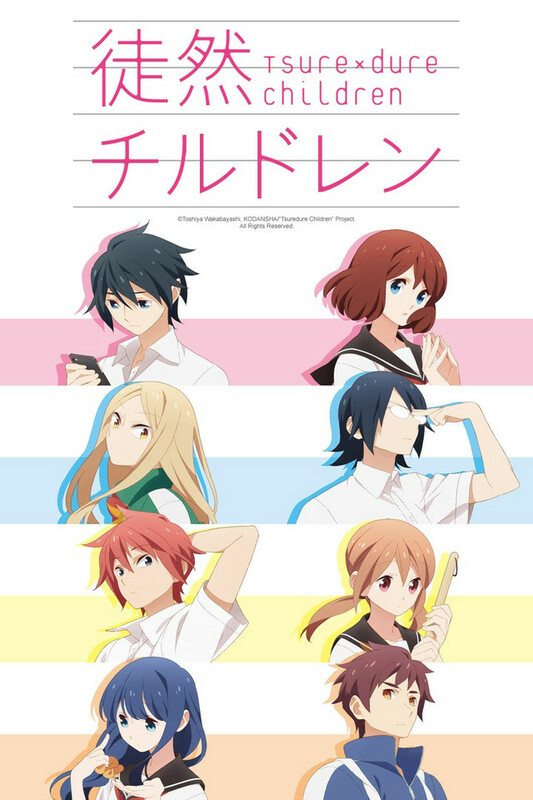 Tsuredure Children is a fantastically well done adaptation of a similarly well done manga, and I can only hope that we'll get more of it in the future. In the meantime: Watch it. Right now. I was instantly charmed the moment a coy non-nonsense student counsel president charmed his way to the heart of a smoking delinquent girl boasting of her non-existent sexual escapades. Through his confident exterior and the lowering of her guard an incredibly entertaining well-realized moment was crafted. Both the comedy and sincerity of the romance in that part could be felt at full force thanks to great vocal performance, writing, and cute character animations. It's look is simple but is always pleasant to look at. Each 12 minute episode is divided in 4 skits each given to a different couple. Each narrative is unrelated to one another with the exception of the theme of romance and that there is typically something unique about each pair (or at least one of the two). To say this certain something is just typical romance comedy archetypes you've seen before would be a mistake. Their personalities and chemistry feel fun and organic and are not beholden to predictable or cliche scenarios. Maybe at times they stray close but change one vital part of the formula to make things interesting and funny. For instance, first there's a scene where one girl can't confess to an impatient guy who clearly knows she likes him and it's mutual. Following is a scene where a girl has no issue bluntly confessing and admitting embarrassing things to make the boy incredibly embarrassed but without him being taken aback. What's perhaps more funny is the adorably well realized reaction shots and faces as opposed to the writing by itself. What makes everything here most refreshing is how mutually understanding characters are and how comfortable their chemistry feels. Where another anime may make characters too skittish and repelled or overwhelmed by the mere idea of a relationship, Tsuredure does not. This allows the show to trim the tedium and get right to exploring the more fun/cute aspects of these character's relationship. The fact that only about 4 minutes is given to each causes a need to progress briskly without need for much backstory. If you've watched almost any basic romance comedy you probably could already fill in the backstory on your own. Some characters won't be seen in the next episode so their impression has to last. It's easy to get into and I highly recommend it for some quick simple fun. There's not too much depth to look into but it doesn't have to have much thanks to the large cast all adding something different and uniquely comedic. It's charm lasts longer than it's short run time. Probably my favorite wind-down anime of the season but don't ask for the moon out of it. The couples are perfectly adequate, I suppose. Each one is worthy of being a subplot in a generic shoujo anime. I really can't tell you any of the character's names, though. I suppose the main flaw of this is that it really has nothing but copious amounts of blushing, stuttering, and the words "I like you". If you like romance, then you'll like this. If you want something more than just romance, you probably won't find it here. There are a few chuckle worthy moments here and there, but the clear focus is on the romance, which is done well enough to satisfy any romantic. It shoudn't be that bad. It's unfair to judge a show on its first episode alone,and it's already somewhat unique. If you don't like romance mumbo-jumbo,stay away from this thing. I really can't think of any pure romance anime I liked, but this short series won me over. The dialogue and pacing are extremely well-crafted and it never gets too slow or too dull. Most of the characters are surprisingly memorable and there's enough variety to ensure you find at least a few to love. Some characters are more traditional, some are more unorthodox, but all are fun to watch. This show avoids most of the pitfalls common to its genre and when it does falter it moves on quickly enough to regain your trust. It's pleasant and humorous even if you're not a huge romance fan. Overall, an exemplary series of shorts well worth watching if you don't mind a little fluff. love this anime a lot. i havent seen any other animes like this one before so it was refreshing to see something else other than those overly cliched romance animes. All the characters in the anime are good and the last couple were probably my favourite. I do wish the anime was a little longer though since i really enjoyed it. sad to see it end so early with only 12 episodes. oh well, ill just keep dreaming then! Personally, I really enjoyed this anime and am hoping for a season 2. It's funny, cute, and I found myself rooting for all the cast of characters in one way or another. I'm giving this anime a 5/5 for its delivery and execution of material, the creators really put their time and effort into making this a great short episode anime. A downfall that I can think of with this anime is that it left some relationship aspects hanging....because in short, this anime follows 5+ relationships/couples and the struggles they find themselves in. The anime perfectly intertwines each of these couples, but it left me wanting to know more and left me wanting more....which could be a good thing on the animators part. Maybe if a season 2 comes out sometime soon I'll recant this, but as for now that is really the only downfall to this anime I can think of. So, what do I think? I think that if you are reading this review, love slice of life, romance, comedy anime, this is the one for you; and worst case scenario, you waste 12 minutes watching the first episode and don't like it. What do you have to lose? So watch this! Do it! This anime consists of small scenes of various couples - at all stages from just friends/crushing to actually in a relationship. Many of these scenes capture the awkward elements of these steps, and the awkward sides of the characters themselves. I found the humor and awkward scenes relate-able and adorable. There was never really a dull moment in any of the scenes. I didn't dislike any of the pairs, they all had their own charm that kept me interested in the pairing. It was easy watching - as the episodes are short, and each of the scenes are small and only capture a moment of time. I feel this was the right choice for this, as one large episode of any one couple would have dragged it out too much. Definitely a new favorite of mine, when it comes to the awkward romance thing.